Non perdetevi il primo hotel SO Sofitel in Russia, situato nel cuore del ricco centro culturale di San Pietroburgo. In questo hotel, progettato dall'architetto Antonio Citterio, i misteri della Maison Fabergé vengono svelati in un ambiente moderno. Qui vi attendono le viste mozzafiato della cattedrale di Sant'Isacco, oltre al servizio di nuova concezione Just Say So e alle serate mondane SO sulla nostra terrazza panoramica estiva. Dear Mr. C., I would like to thank you for taking time to have responded to our questionnaire. I am glad that you have enjoyed our famous Just Say So service, there to grant your every wish, as well as our splendid location in the very center of the city. I wish you could tell us more about what we would have done better during check-in and what would have been there in your room so that we are sure to have exceeded your expectations next time you visit us. I would highly advice you do so in the summertime to feel the romantic vibe of St. Petersburg’s famous White Nights period. Best regards, Ada Egorova, General Manager. Dear Miss F., thank you for taking time to rate your stay. I am very excited that you have enjoyed our central location in the very heart of the city as well as our excellent Just Say So service aimed to grant your every wish. I am sad that you left not 100% satisfied with your breakfast and I would like to reassure you it features the best available quality of local products, as well as a variety of specialties to be chosen either via buffet or a la carte menu. I would like also like to ask you why exactly you were not impressed with the check-out process. I really hope that you could come back to us again during summer to enjoy breakfast with champagne on our panoramic terrace, so that you are sure to give us a highest note on value for money criteria. Best regards, Ada Egorova, General Manager. Perfetta. Camera di livello , peccato che non è la vista città ! Dear Mr. F., thank you so much for taking time to respond to our questionnaire. I am glad that you’ve enjoyed your stay and our superb location a few steps away from the city’s main attractions. 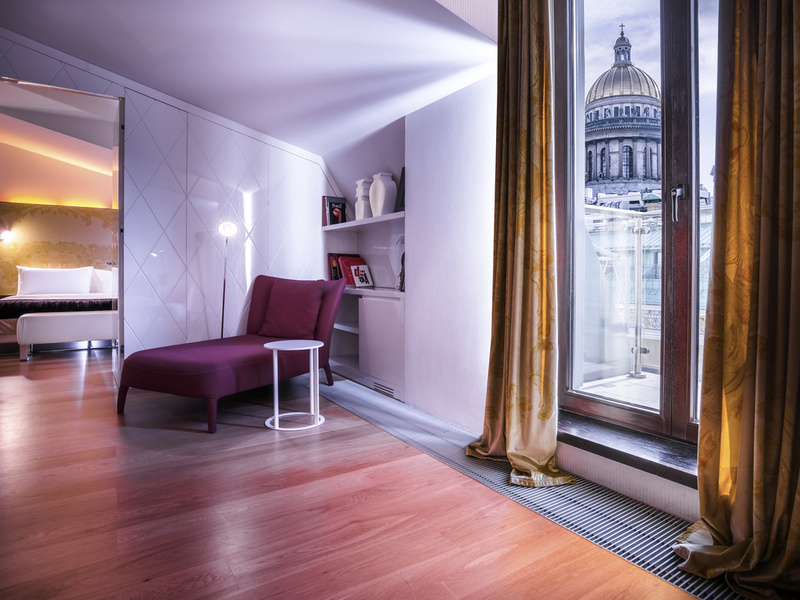 I would highly recommend that next time you stay with us you opt for an upgrade from So Cozy room with views over tranquil courtyard to a So Comfy room with views over elegant Voznesensky Avenue, or even So Club room, from which you can get a glimpse over St. Isaacs cathedral. I would also wish that you could specify what exactly didn’t exceed your expectations when it came to check-in, check-out and interaction with our staff, so that you are sure to get the best “value for money” impression next time you visit us. I will be waiting for you to be back during the summer time to enjoy the grandeur of St. Petersburg during the white nights. Best regards, Ada Egorova, General Manager. Dear Stefania, Thank you so much for your positive feedback about SO/ St. Petersburg. I am so glad to know that you have visited our magnificent city and chosen SO/ St. Petersburg for your stay. I am happy to hear that due to hotel’s gorgeous location and the unique and glamorous interior created by famed Italian architect Antonio Citterio, you fully enjoyed your stay and rated it so high. I would be glad if you would get an opportunity to come back in the nearest future to enjoy a large number of events, exhibitions and tea evenings with excellent DJ sets. Sincerely, Ada Egorova, General Manager. Sincerely, Ada Egorova, General Manager. Credo sia uno degli Hotel più belli che abbia visto . Molto bella la camera e ottimo il servizio e la colazione. Dear Letizia, Thank you so much for your feedback about SO/ St. Petersburg. I am so glad to know that you appreciated our cozy and stylish interior created by famous Italian designer Antonio Citterio and our Just Say So unique attitude which is created for making your stay here unforgettable. I will be happy to welcome you in SO/ St. Petersburg as soon as possible to enjoy our exhibitions and fashion shows with beautiful DJ sets in MIXO lobby bar. Best wishes, Ada Egorova, General Manager. Personale gentile, stanze ampie e confortevoli, servizi igienici moderni e comodi, colazione di ottima qualità. Ogni richiesta è stata accolta ed ogni informazione ci è stata fornita con molta gentilezza. Dear Andrea, Thank you so much for your feedback about SO/ St. Petersburg. I am happy to read that you enjoyed your stay in a modern and stylish room, designed by famous Italian architect Antonio Citterio. It is also a pleasure to know that due to our unique Just Say SO attitude you felt privileged and heartily welcome. I am looking forward to see you again in the nearest future to spend fantastic time in our hotel and enjoy signature drinks in our MIXO lobby-bar with stylish and cozy atmosphere. Sincerely, Ada Egorova, General Manager. Hotel molto accogliente, arredato meravigliosamente, staff molto gentile e disponibile, posizione ottima. Bar molto bello, ristorante ottimo. Buona esperienza presso l'albergo, consiglio di migliorare lievemente il servizio di rifacimento Delle camere durante il giorno da parte delle cameriere. Ottimo Hotel. Personale estremamente gentile. Soggiorno piacevole in un hotel centrale, vicino all’hermitage. Buon servizio di conciergerie ! Tutto perfetto, personale molto cordiale. Le camere sono molto confortevoli, silenziose. La piccola colazione è molto soddisfacente.